This book attempts to trace military history of the mounted horse and the chariot, both of which are represented in art and poetry, as they were used from the Dark Age to the end of the sixth century BC. GreenHalgh argues that warfare of their experience (Homeric bards and Late Geometric vase painter) can only be revealed by removing the heroic veneer. In the vase painting in the seventh and sixth centuries, few warriors were shown in combat but artists in at least two states gave accurate portrayal of mounted warriors and contemporary life. This chapter examines the war-chariot as it is treated in Homeric Epic. The battle scenes depict it in great numbers at the exclusion of the mounted warrior. The advantage of the war-chariots is in the massed attacks at speed. The Mycenaean kingdoms of Near and Middle East maintained large forces of chariots in Bronze Age and after the Mycenaean collapse. 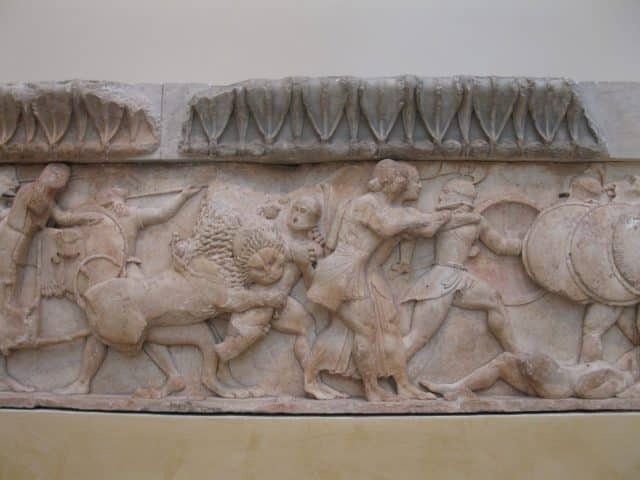 The Homeric portrayal of the war-chariot is very different in that he depicts warriors as using the chariots as transport vehicles, from which to dismount and fight on foot. They were not equipped with a lance or bow, which were the two weapons that made the fast spoke-wheeled chariot formidable in the first half of the second millennium. The use of the chariot for taxi service during the battle is impractical. Homer did not know of the complex bureaucratic palace administrations, which enabled the great Bronze Age kingdoms to produce and maintain large bodies of chariots. Warriors of the Geometric Age could not have afforded the luxury of the war-chariot from which they would never fight. The economic argument reinforces the tactical one. In the Iliad there are only three other allusions to massed chariot attacks, even though it is in the massed attack at speed that the chariot is most effective weapon of war. There are no direct clashes of massed chariots and very few references to any fighting from chariots, moving or stationary. Usually the warrior dismounts to fight on foot. Nestor’s speech of spear thrusting suggests a Mycenaean survival and the usual Homeric chariot-borne warrior’s style is to throw his spears. There are only four occasions in the Iliad where individual warriors fight from the chariot. In two the warriors are depicted throwing javelins and not thrusting spears. Euphorbus is described as an expert in fighting from a chariot, but he also is found throwing javelins. The author feels that the use of chariots for transport behind the lines is not impractical, with reasonable terrain, but the same cannot be said for their use to transport individual warriors through the thick of battle. The javelin is the main weapon of Homeric chariot-borne warrior which makes the chariot such a formidable weapon of war after the revolutionary invention of the light spoke-wheeled chariot in first half of the second millennium. The Bronze Age chariot powers turned to larger thrusting spear and relied for success on speed, accuracy, mass of their massed attack, or on bow to provide a more accurate and forceful fire-power than the javelin over a longer range. The Hittites used the first method and the Egyptians and the Assyrians the second, as simulated on Abu Simbel reliefs of the Battle of Kadesh in 1288 BC. T.G.E. Powell states that Egyptian reliefs do not show the head on clash of chariots and massed charges are impossible. He believes that the chariot was used before battle, to drive up and down before the front lines, exchanging arrows at a range that did not endanger the horses, and secondly used for pursuit by the winning side. The Egyptian chariots carried archers and the Hittites were armed with seven-foot long thrusting spears. There is sound conjecture that the Mycenaeans used chariots as the Hittites did. 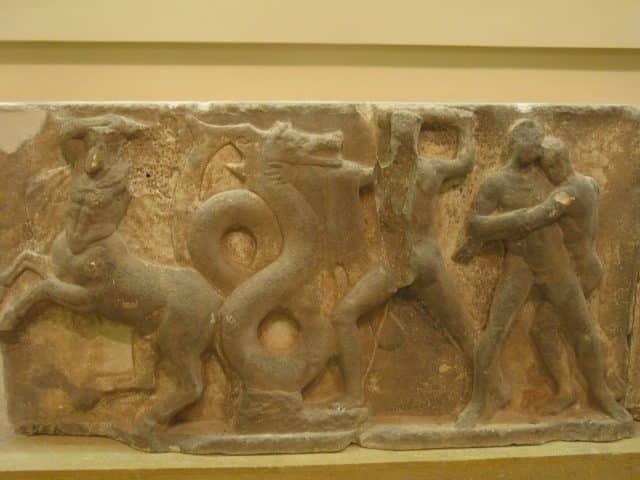 Linear B tablets attest to the use of chariots in war. In Geometric vase painting of the late period, when figured scenes with chariots occurred for the first time (middle of the eighth century BC), the chariots appear in a military context as they are treated in the same way as in the epic, which is primarily as transport for armed warriors with exception of a few examples of fighting from chariots. The javelin is always used, never the bow or lance. Spears, when used, are shown being thrown. The Geometric artists were as vague as the Dark Age bards about the effective use of chariots in battle. This chapter examines the chariot as represented in Attic Late Geometric art in the second half of the eighth century. The earliest chariots were modeled on contemporary racing-chariots which were the same used for races by the Athenes and other mainland Greeks in the sixth and fifth centuries and racing-chariots had been known for a long time before their appearance in Geometric art. Chariots had different uses. Contemporary racing-chariots were familiar to Homeric bards and Late Geometric artists but were used in war. Chariots are featured in the poems’ battles. There is neither direct of representational evidence of chariots between the collapse of the Mycenaean world and the second third of the eighth century BC, when they appear on Attic Late Geometric vase painting. It must remain unproved that chariots were or were not used continuously in Greece during the Dark Ages. The chariots of the late Geometric time show a familiarity with form of contemporary used of racing chariots which were basically the same as those raced by the Athenians and other mainland Greeks in the sixth and fifth centuries BC. Athenian racing chariots in sixth century appear on vases and are put into epic battle scenes by Black Figure painters. The Homeric poems show little familiarity with social, economic, and political conditions of the Mycenaean world, or its burial customs, so it is more likely that detailed descriptions of chariot racing are based, with heroic exaggeration, on contemporary life in the Geometric period. Possibly Homeric chariot usage reveals acquaintance with Ionian racing-chariots. Metal decoration is ascribed to some chariots and this could indicate Bronze Age or oriental reflection. Homeric technical vocabulary reinforces the economic and tactical arguments that the use of the chariot in war was based on the knowledge that Mycenaeans had used war-chariots in war, as depicted in Homer and copied in Geometric art, and was achieved by putting all noble warriors into racing chariots. A further factor in the use of chariots on art keeps the chariot as the essential status symbol of nobles whom as Odysseus states, were the only people who count in war. The author believes that Dark Age bards heroized and archaized warfare of their own experience by transferring to heroic chariots the military and social functions of the mounted horse. Aristotle speaks of mounted warriors as dominating the warfare of early Greek cities at the time of the disappearance of kingship and transition to aristocratic republic. The keeping of horses is a sign of considerable wealth. During the first half of the first millennium there was a gradual shift from emphasis on chariotry to cavalry. A mounted warrior does not appear even once in Homeric battles. 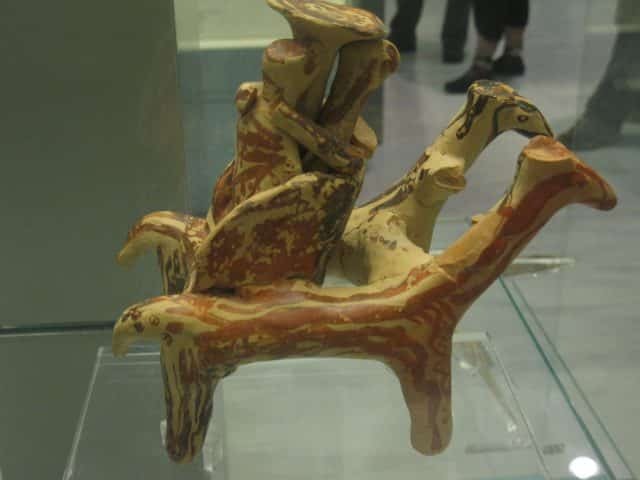 Armed and unarmed riders are depicted by Geometric and Early Archaic terracotta figurines. Figured representation is rare in Geometric art and only found in late Geometric period. Javelin from horseback was used and was the principle weapon of cavalry squadrons of classical city-states when the heavy thrusting-spear had long been revived for organized hoplite infantry. Horses were used to transport heavily armored warriors who then dismounted to fight on foot and had the squire along to mind the horse. Dark Age bards were familiar with mounted knights accompanied by mounted squires but put them into war-chariots to heroize and archaize their picture. Reconstructed battles of Geometric Age, from evidence of Homeric poems, reveal a fairly disorganized picture of clashes between heavily armored warriors who rode into battle and dismounted to fight and who were attended by mounted squires whose job was to hold the warrior’s horse during the fight and to help in the remounting. Homeric horsemen were essentially a foot soldier. Dipylon shield was a realistic and practical shield for Geometric Age knight to have used. Most Dipylon warriors, either fighting or marching are shown with both hands free. The shield was suspended from the shoulder with a telaman and the incurved edges were for greater freedom of the arms. Many had a single central handgrip and could be swung around from the back to the front. A convex shield is preferable to a flat one because it more readily deflects spears and arrows. Then the shield was developed with an armband in the center and handgrip at the edge. The shield covered the left side and right side of the man to the left of him. Phalanxes tended to go to the right because each man moved his exposed side as close to the shield of the one on the right as possible. 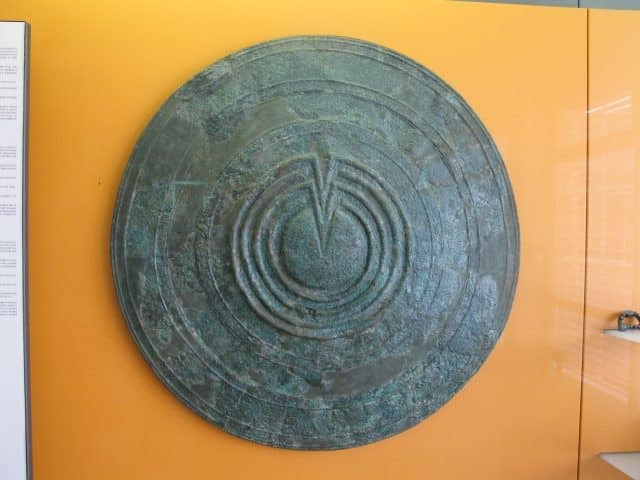 The hoplite shield was dropped in flight, as it was difficult to run with the elbows restricted. Besides the shield, the hoplite had helmet, greaves, and corselet. They had a sword hung at the side and carried a seven to eight-foot spear to be thrown overhand. Order in the ranks was of the essence and the aim was to break the enemies’ line while preserving their own. The expense of the equipment limited the hoplite class to the richer sections of society. Archaic Greeks did not have horses that could bear vast weight of armor. A flanking attack on an advancing phalanx would break it up. The cavalry could ride around and come from behind. Pure cavalry battles would develop on the wings. 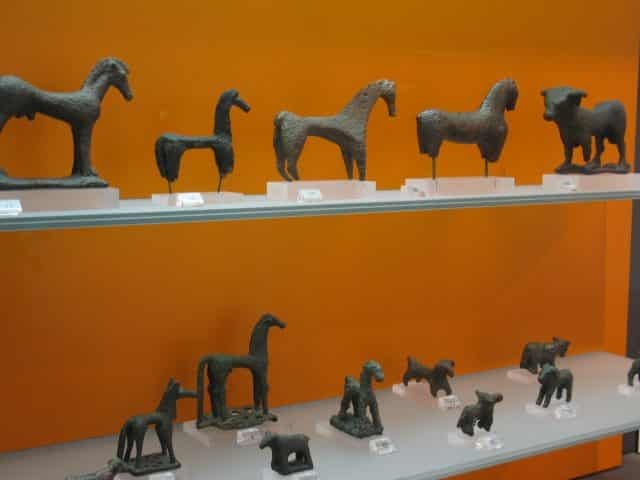 Corinth– Until the ripe Corinthian period, which begins in last quarter of the seventh century BC, the evidence of use of the horse in war is scanty. There is considerable interest in riding, and riders do have a firm place as favorite Protocorinthian motifs. 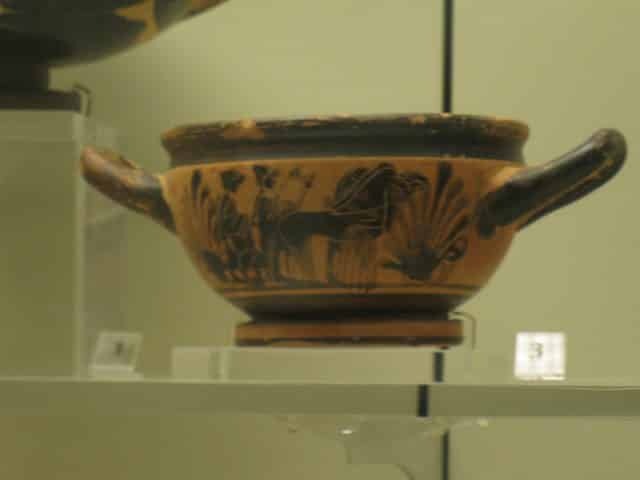 Other than the occasional Bellerophon who aims a spear as he rides his winged horse at the Chimeara, there is no evidence of cavalry on Protocorinthians vases. 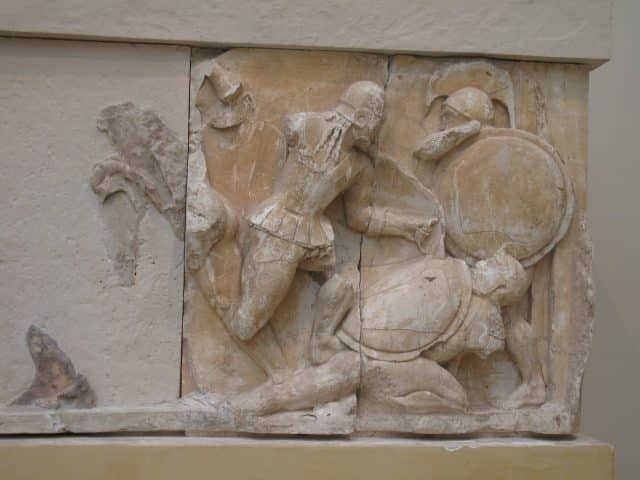 There is evidence of mounted infantry through all of the seventh century Corinthian art. 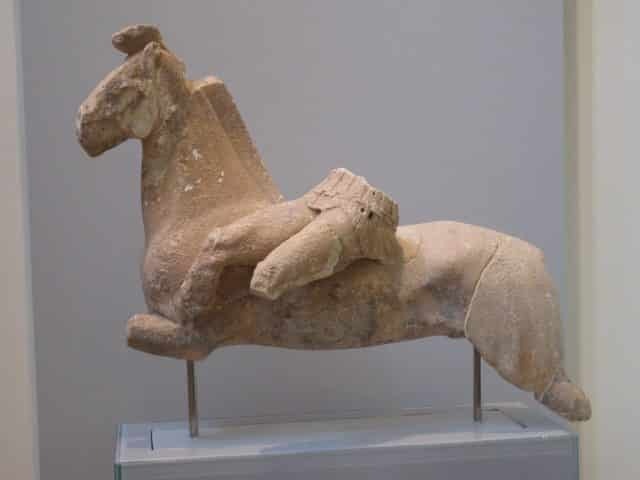 Athens—The Attic Late Geometric horsemen with their various items of arms and armor indicated both a knowledge of riding and a military use for the mounted horse in the later eighth century. Euboea—No true cavalry in Greece from sixth century BC to Alexander ever used the sword as their weapon. Most preferred spears, javelins, lances, the xyston, and the bow. Vase paintings of the Ripe Corinthian style show illustrations of horses in the military context become more common. The scenes of actual fighting are few. It is impossible to fight from horseback with a large shield. Some artists depict a warrior equipped with a shield leading his horse or walking slowly but the vast number of depictions are without shield when the warrior is mounted. Chalcidian—Most knights are shown with round shields. This pottery of the second century favors the motif of chiton-clad youths riding either singly or in files and carrying a long single lance. The use of horses are depicted by 1) panoplied knight who is accompanied by a mounted squire and dismounts to fight as a hoplite in the phalanx 2) armored archer 3) unarmored archer. Aristotle spoke of the military and political dominance of aristocratic horsemen. They were not cavalrymen, but heavily armed foot soldiers who used horse as transport and were accompanied by mounted squires who kept horses and spare javelins for them while they fought. Success of phalanx depended on its cohesion and victory went to the side, which broke the ranks of the other side while keeping its own intact. The cavalry generally came in on the sides and rear of the phalanx. The Greeks learned to support their phalanxes with cavalry squadrons of their own. 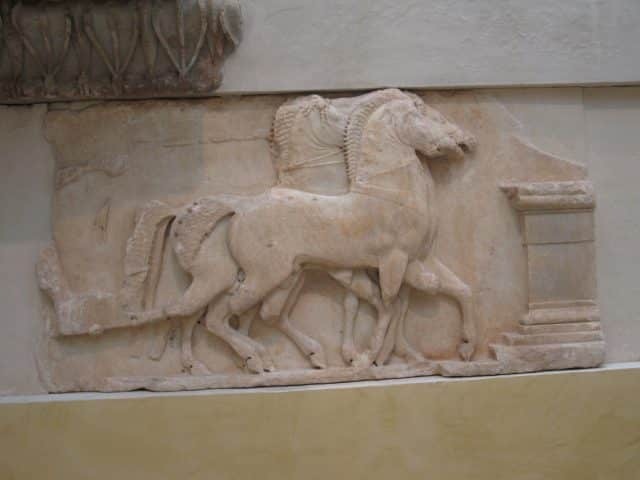 Experiences gained in foreign adventures contributed to development of Athenian cavalry. Aristotle’s theory was that the hoplite reform was connected with the trend to more democratic constitutions because it removed military supremacy from horse owning aristocracy. In the fifth century BC the hoplite force took second place to city’s fleet and the importance of the fleet maintained the universal thetic suffrage and doomed from the outset the oligarchic plans to restrict the franchise in the later phase of the Peloponnesian War. The greater numbers required by phalanx warfare and the smaller degree of skills and training meant that the military class often needed to be socially less exclusive than before. Hoplite panoply remained expensive and possibly the state may have equipped its hoplite force (Sparta). Sometimes nobles may have armed retainers (Meno of Thessaly) and had a private army of serfs. Hoplite warfare was organized, and various regions were dominated by aristocratic families, Alcmaeonidae, Pisistratidae, etc. Athenian republic required continuing agreement of the great aristocrats to take turns ruling and being ruled, or to force others into submission. Occasionally a tyrant gained power by purely diplomatic means of playing aristocratic factions against each other. Thesis shows historical reality behind Homeric picture of chariot warfare and maintains that poems show no real conception of the Mycenaean world, but rather disguised pictures of condition in Dark Age communities. Countless individual battles can be discounted as historical battles but are relevant to the history of art of war. Inconsistencies show how little Homeric poets knew of life in the Bronze Age Greece. There is deliberate archaizing and heroizing. The Homeric picture presents an amalgam of cultures spanning both the Bronze Age and the Dark Age into the eighth century BC. Ajax appears on the Mycenaean pottery and also on Linear B tablets. Homeric social relations and obligations are not of feudal nature. The Mycenean palace states were absolute monarchies. Homer uses wanax and pasireu, who is a local dignitary of inferior status, interchangeably. 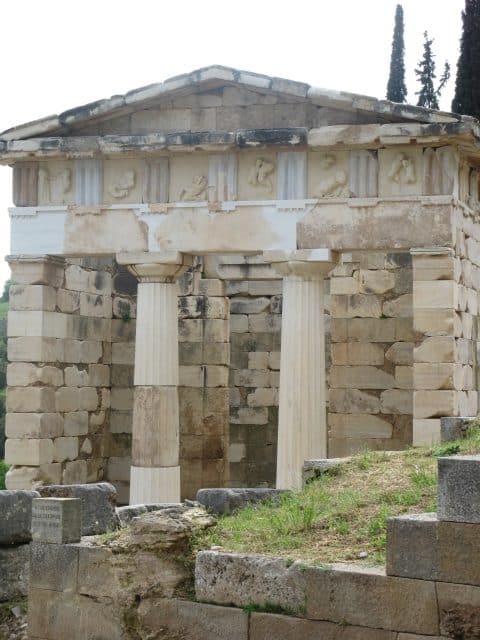 Cremation in Homer’s time as opposed to multiple inhumation which was the Mycenaean method. No suggestion that Homeric pictures belong to the periods of chaos and migration as in Mycenaean collapse. Throwing spears, tripods, separate temples all point to ninth century BC at the earliest. Homeric communities are not yet city-states and the first city-states were aristocratic republics, and this was not represented in Homeric world. I know about it because I have a friend who served in one of the British Army’s Household Cavalry regiments, and had to learn to ride a horse for ceremonial duties. He told me that the key thing when being on a horse moving fast was to dig you knees into it’s flanks as hard as you could and stand up in the stirrups, otherwise you will bounce out of the saddle. Without a good footing in the stirrups, if you tried to turn left or right while the horse was galloping, you fell off, if you tried to do much of anything other than cling on for dear life and ride in a straight line, you had to have good footing in the stirrups otherwise you fell off. Basically, recruits to his regiment spent the first 3 months falling off horses, and these are big cavalry horses, almost the size of a draught horse. Broken bones were just part of the learning experience. You would think that given the weapons at the time; that calvery would quickly evolve as the most effective way to use the horse in war. It was the development of the stirrup that made cavalry effective, which didn’t happen until early modern times – the Romans had no stirrups, for instance. Without the stirrup, you can’t do much on horseback other than hold on and try not to fall off, but with the stirrup, you can effectively wield weapons like swords and lances. I love looking at all the art in museums . . . from Ancient Greece, Ancient Rome . . . all being en massed for viewing pleasure. Those objects were the “spoils” of war, and fenced.